Gum disease is often a condition we associate with adults and bad habits. But children can (and do) get gum disease, too. If left untreated, it can cause big problems once little ones hit puberty. But the good news is that gum disease is easy to prevent with basic oral care practices like brushing and flossing. And just like preventing cavities, good gum habits we develop in childhood stick with us as adults. 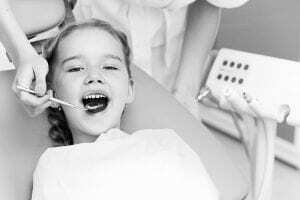 Is Gum Disease Common In Children? Gum disease is caused by the same dental plaque that causes cavities. Plaque is a clear film that builds up on teeth, and children have a natural propensity to produce plaque, fueled by carbohydrates found in milk, juice and higher sugar foods. And while it’s unusual for children to get serious gum disease, gingivitis (the early stage of gum disease) is more common in children than you may think. According to the American Academy of Periodontology (AAP), which is made up of dentists specializing in gum disease, gingivitis is fairly common in children, while a more serious condition called periodontitis can happen as early as the teens if it isn’t treated in the early stages. The important thing to note is that gingivitis can be prevented and turned around before it progresses with a simple routine of brushing, flossing and regular preventive dental care. Gum disease is caused when bacteria in plaque build up between the teeth and gums. The mildest form of gum disease is called gingivitis. It involves red, swollen and/or bleeding gums and is usually treatable with better oral care like brushing and flossing and regular dental check-ups. Periodontitis is a more serious form of gum disease that can happen when gingivitis is left untreated. When bacteria from plaque get below the gumline, they create inflammation that can actually damage the bones and tissues that support the teeth. When gum disease progresses, gums begin to pull away from the teeth, which can become loose and in some cases need to be removed. Periodontitis is rare in young children but hormonal changes related to puberty can increase the risk of periodontitis in teens. How Can My Child Prevent Gum Disease? Gum disease sounds scary, but in most cases it is easy to prevent in children with a few simple habits. And when good habits start young, they are more likely to last a lifetime. Establishing a good brushing and flossing routine is the most important thing you can do to prevent gum disease. Plaque forms when foods and drinks are left on your child’s teeth. So getting rid of plaque is the best way to prevent gum disease. In some cases, your dentist may also recommend a children’s anti-plaque mouthwash to reduce plaque and help remove food particles. You can also help by making sure your child is eating a healthy diet. Limiting sugar helps reduce plaque buildup. And certain vitamins found in fruits and vegetables can help build up your body’s defenses against gum disease. In addition to setting up a positive oral care routine at home, getting regular check-ups is key. See your pediatric dentist twice a year for preventive care, and ask your pediatric dentist about dental sealants for your child which can also prevent plaque buildup and help improve oral health. 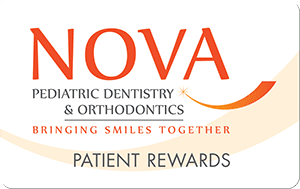 At NOVA Pediatric Dentistry & Orthodontics, one of our goals is to prevent or stop gingivitis before it gets worse by helping your child develop good habits like brushing and flossing that will last a lifetime. It’s one case where an ounce of prevention is truly worth a pound of cure! For more tips on how to help your children avoid gum disease, contact us today for a consultation. © Copyright 2017 Nova Pediatric Dentistry & Orthodontics. All Rights Reserved.